Cost effective fixed installation gas monitors with HART Field Communications Protocol. Single-sensor units use catalytic, electrochemical and infrared gas detection technologies for detection of combustible and toxic gases and for oxygen deficiency. 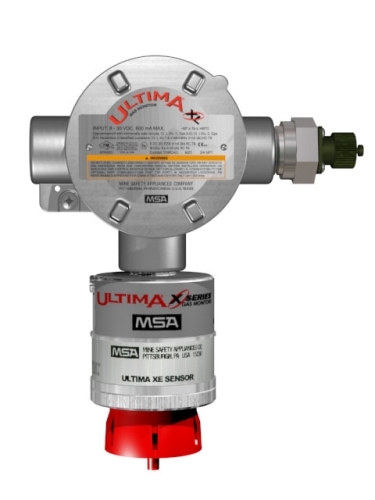 ULTIMA XL/XT Series Gas Monitors offer an affordable choice in continuous gas detection and monitoring while retaining key features and sensors of MSA's ULTIMA X Series Gas Monitors. HART Field Communications Protocol running over 4 - 20 mA output provides convenient setup, calibration, and diagnostics.The handheld HART communicator, controller or laptop provides a display, while local calibration employs LEDs and push-buttons. The ULTIMA XL Gas Monitor is explosion-proof with a stainless steel enclosure, while the ULTIMA XT Gas Monitor uses a general purpose plastic housing. The enclosure for the ULTIMA XL Gas Monitor has three entryways for sensor, intrinsically safe HART port and signal/power wiring. These versatile units are well-suited for both indoor and outdoor applications within oil and gas, chemical and petro-chemical facilities, refineries, steel mills, water and wastewater treatment plants, general industry and many others.